Previewed at: Event Cinemas, George Street, Sydney, on 20 July 2017. It’s been quite a graphic journey for the rebooted Planet of the Apes franchise and it keeps getting better and better. Stemming from Rise of The Planet of the Apes (2011), continuing with Dawn of the Planet of the Apes (2014) and now, completing this astonishing trilogy, Matt Reeves’s War for the Planet of the Apes. The moment the film opens you’re immersed in the hostilities as the camera pans over a group of paramilitary fighters (Alpha Omega - AO) creeping through the jungle wearing helmets emblazoned with slogans like ‘monkey killer.’ They’re searching for apes and soon they stumble on a base and a heated battle ensues. AO, a break-away group of rebel soldiers, is headed by the Colonel (Woody Harrelson; in what can only be a deliberate homage, the film has him emulate Marlon Brando’s Colonel Kurtz from Apocalypse Now, right down to his shaven skull) and it’s evidently on a mission for total control of the planet and that means wiping out the developing and evolving ape species… and anyone else who gets in the way of the Colonel’s crusade. The apes’ leader, Caesar (Andy Serkis), and a large group of fellow travellers, are trying to survive by avoiding conflict with the humans but, when the Colonel infiltrates his hideaway and kills members of his family, violence escalates. Caesar sends his troop of apes off to find a safe haven while he and three of his most stalwart allies - Maurice, the orangutan (Karin Konoval), Luca, a gorilla (Michael Adamthwaite), and Rocket, a chimpanzee (Terry Notary) - head off to find and kill the Colonel. En-route they pick up a young human girl, Nova (Amiah Miller), who is mute, and a chimpanzee known as Bad Ape (Steve Zahn), who’d previously been kept in a zoo. This motley crew continues the journey to The Colonel’s compound, which is in an old quarantine station where captured apes are being forced to build a massive, defensive wall. The question is, why? This is thrilling stuff and the apes are so realistic - except for the absence of genitalia - it’s hard to believe there’s a motion-captured human behind the façade, especially Serkis’s Caesar. In close-up, you can see in detail every pore and whisker on his skin and it’s extraordinarily true-to-life. Serkis himself is at his very best. Steve Zahn’s Bad Ape is poignantly funny, especially when he dons the ubiquitous uniform of ‘puffy’ jacket and baseball cap in preparation for the expedition. It’s not surprising that the visual and technical effects credit lists are as long as the film. 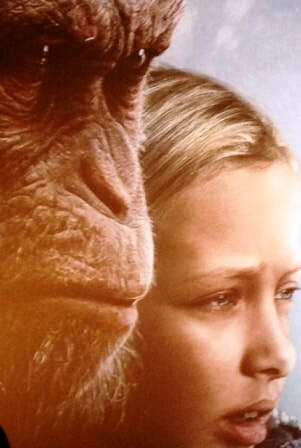 War for the Planet of the Apes enters another dimension in CGI - if Caesar represents the apotheosis of ape evolution, so too do the visual effects on display here (once again by NZ’s Weta Digital) exemplify the peak of today’s film technology. In fact, all the technical credits of the film are superb. You can bank on Oscar nominations in these areas next year. Prolific composer Michael Giacchino’s score is magnificent and complements the lofty themes of director Reeves and Bomback’s script. The Planet of the Apes trilogy is an epic saga that’s almost biblical in its scope and I, for one, am sorry to see it go. All Hail Caesar!